I was listening to one of my motivational podcasts last week (yes, I know, should probably start all of my blog posts with a podcast-themed intro since I’m so addicted to them), but the guru had some great advice. She does business coaching to a variety of clients and in this segment, she was telling people what kinds of things they need to start their business. Because I know we’ve all been there, right? 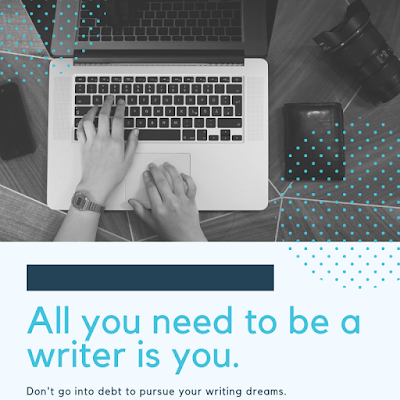 You decide you want to be a novelist/freelance writer/copy editor/blogger, etc. So you invest in a bunch of equipment and business tools, such as a brand-spanking new computer, professional website designer, new software for invoicing etc. And before you know it, you’re more than $1,000 in the hole before you’ve even landed your first assignment. Her point in the podcast was that you don’t need any of that. When this particular motivational speaker started out as a wedding planner, she printed out business cards and had some photos taken that featured her design aesthetic. And for that, she bartered with people she knew in the industry so they could all use the same set of photos featuring a cake, table settings, backdrops, etc. Once she landed her first few jobs, she was able to use those in her portfolio to help her land more jobs. She worked a full-time job as an event planner while working for free wedding planning on the weekends so she could learn the business. She made sure she had minimal start-up costs. I thought back to when I first started my own writing business. I needed an e-mail account, a printer, minimal postage because I still sent out a few snail mail queries to magazine editors, a fax machine (I’m starting to date myself here) and a few how-to books on the art of query letter and freelance writing. And that was it! As my writing business grew and my kids came along, I needed money for childcare on the days I needed to conduct interviews on phone and in person. Over the years, I’ve started to invest more in my writing. I still don’t have a graphic designer, but I pay a web hosting service so I can have a professional website, where I use existing templates to fit my needs. I also pay entry fees to enter writing contests every few months to keep myself productive. Every few years I try to attend a writing conference where I can network and partake in my own professional development. And I take online writing classes and workshops when I can fit them into my budget, and pay to have my writing professionally edited before sending out literary agent queries. I say all this to point out that you don’t have to go into debt to pursue your dream of becoming a writer. I’m lucky now that I have a full-time job that can help supplement my writing projects, but that wasn’t always the case. I’ve hustled for plenty of years and spent minimal amounts of money while still selling articles and maintaining good relationships with a number of editors. I strongly feel that consistently turning in polished work and keeping in contact with editors is far more valuable than any software or equipment you could buy for your writing. Where do you invest the most money in your writing? Do you agree or disagree that you don’t need to spend a lot of money to be a successful writer? Renee Roberson is an award-winning writer and editor who also works as a marketing director for a nonprofit theatre company, where there’s never any shortage of drama! Visit her website at FinishedPages.com. Renee--I don't consider myself a successful writer, but I agree: you don't need to invest a great deal of money in order to write. As long as you have a computer and access to a printer, you can get along with just that. A bonus: if you can spend money occasionally on a workshop/conference/contest, that will benefit you as a writer. Excellent article Renee! And I totally agree that you don't need to spend much money to be a writer. I always like to emphasize the benefits of libraries as a great free resource for writers. Doing historical research for a book, reading up on ways to craft a novel, using the printer at the library instead of owning one, etc etc. There are many ways to save money. I just listened to that same podcast--Was it Rachel Hollis? Rise? I am also addicted to podcasts--love Jen Hatmaker's FOR THE LOVE. Anyway, I thought she made a lot of great points and it's something I've always thought a lot about. The problem is we are so much smarter about what we actually need once we've already been in the business for a while! Sioux--I've been trying to take any money I earn from writing and turn right back around and invest it in myself with a class, critique, contest, etc. Except for the other day, when I took a freelance check and immediately spent it on some cute clothes at ModCloth! Pamela--Ditto on the recommendation for the library. When I was first starting out as a freelance writer, I would go to the library to study back issues of magazines I wanted to query. No one has the money to buy ten different magazine subscriptions for study purposes! Plus, they have so many great non-fiction books for the writing craft! Margo--Yes, it was Rachel, ha ha! I also love JH. I got behind on hers and need to catch up on it. It is funny how much wiser we get about these things as we get older. I know I probably drove my family crazy in the beginning when I was trying to figure things out. Renee, this is something I needed to read today because I have a steady client for now, and we do everything through emails, etc. I didn't have to invest in anything, but I'm waiting for my first check to buy some new business cards! I recommend VistaPrint for affordable business cards! They are easy to design and the delivery is quick. Good luck with your new client!